Chapter 13. Four Low-K Siliceous Rocks of the Western U.S.A. Developments in Petrology, 6: Trondhjemites, Dacites, and Related Rocks focuses on the geology, geochemistry, and petrology of several kinds of trondhjemites, dacites, and genetically related rocks. The selection first elaborates on the definition, environment, and hypotheses of origin of trondhjemite; a review of the mineralogy and chemistry of tertiary-recent dacitic, latitic, rhyolitic, and related salic volcanic rocks; and some trace elements in trondhjemites and their implications to magma genesis and paleotectonic setting. Discussions focus on tectonic environments and trace element patterns, selection and reliability of trace elements, interrelationships between mineralogy and chemistry, and regional variations of dacitic and rhyolitic magmas. The publication then tackles strontium isotope geochemistry of late Archean to late Cretaceous tonalites and trondhjemites; Archean gray gneisses and the origin of the continental crust in West Greenland; and metamorphic development of early Archean tonalitic and trondhjemitic gneisses in Saglek Area, Labrador. 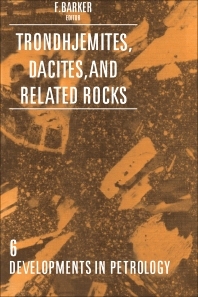 The book examines the petrology, geochemistry, and origin of the Sparta quartz dioritetrondhjemite complex; reconnaissance geochemistry of Devonian island-arc volcanic and intrusive rocks in West Shasta District, California; and origin of the Twillingate trondhjemite in North-Central Newfoundland. The selection is highly recommended for geologists and geochemists wanting to explore trondhjemites, dacites, and genetically related rocks.